I am a huge fan of travelling to countries where I know someone who lives there. Over the years on my various trips I have been lucky enough to visit and stay with friends and friends of friends who have all been able to show me a side of the country I am visiting that perhaps I would not see if I did not know anyone. 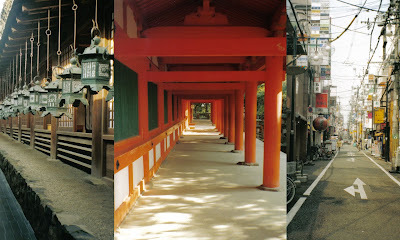 Way back in 2003 – I took myself off to Japan for 3 weeks to stay with my soon to be Brother and Sister-in-law who were living and working (teaching English – as you do) in Tokyo. Using them as a base I spent a few days with them and then packed myself a smaller backpack and took off on the Shinkansen fast tracking my way around the island known as Honshu with stops at Kyoto, Nara, Osaka, Hiroshima and Yokohama. I had always wanted to travel to Japan – ever since we’d had Akiko the Japanese exchange student stay with us when I was a girl. I had also studied the Japanese language at high school for 4 years and of course just adored all the cutesy little things like the Little Twinstars sharpeners, pencils and erasers my Mother had bought for me when I was small. So you see – I was very excited to finally be in Japan. The main things that struck me whilst I was there were the fact that I felt absolutely 100% safe at all times – even going out by myself at night and walking back to my Ryokan down little side streets and laneways and the striking diversity and beauty of the Shinto Shrines and Buddhist Temples versus the busy fast paced streets of Tokyo and the larger cities. Both were equally amazing and striking in their own ways. And without a doubt the food! Yum Yum – my mouth waters just thinking about it especially the takoyaki (octopus balls) in Osaka. I was in food heaven! The photos above are just a small sample of the many I took on my journey. 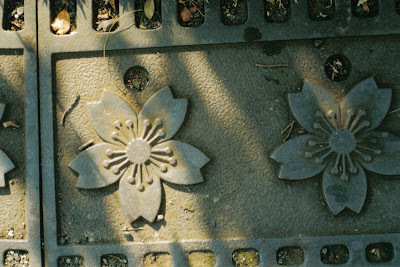 One of my favourite shots is of the cherry blossom decoration I spotted on a grate on the footpath. What an amazing place. If you ever get the chance to visit – I highly recommend it.